Today was another fun day at Appel Farm! Campers enjoyed a full day of majors and minors – we even shared highlights from Major 1 on our Instagram Story. If you’re not an Instagram user, that’s okay – we send everything from Instagram directly to our Facebook Story. You can view our Story updates from the Instagram and Facebook apps on your phone, or by logging into your Facebook account on your desktop computer or tablet. The story is only available for 24 hours, so make sure to check in every time you see an update! Tonight brought back one of our most beloved Appel Farm evening programs – the World Fair Campfire. This session, we hit a record number of booths at the campfire – there was SO much to do! From learning another language to perfecting your New York accent, campers filled their passports with experiences from all over the globe. Of course, no campfire is complete without S’MORES! 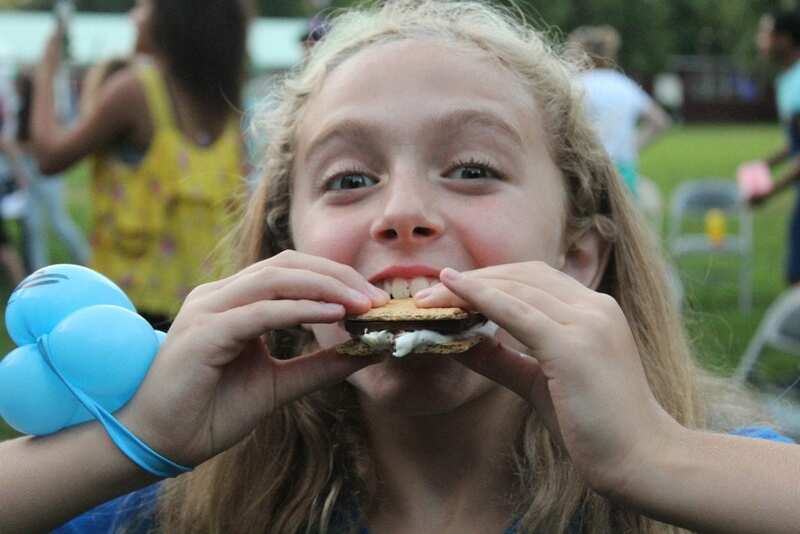 Make sure to log in to Camp-In-Touch to see come close up shots of campers devouring their ooey gooey s’mores! We got to end the night with a beautiful campfire story, told by our Nurse Ruby. As she passed sand around the fire for everyone to hold, campers broke out singing the Appel Farm song. While everyone sang, Ruby tossed the sands on to the fire, and the whole fire started to glow in rainbow colors! You could hear the “ooh’s” and “aah’s” as campers watched the flames change color. It was a truly magical night. Thursday, August 2nd & Friday, August 3rd! • Our theater seats about 325 people, and we already have 300+ people here with our campers and staff. We are anticipating a very full theater with all of our campers, counselors and guests. We ask that you limit the number of guests you are bringing to 2 people per camper, if possible. We will have video footage available after camp that you can share with friends and family! • Plan to arrive only ten minutes early, because your children will need every last minute for technical rehearsals. • Please only attend the parts of the showcase in which your child is performing. If your child is performing in multiple parts, then you are invited to stay for the entire day. Please take careful note of the instructions above about lunch and dinner. Our kitchen will need to prepare for additional guests, so if you would like to stay for a meal based on your camper’s performances, we need you to let us know via email reply no later than Tuesday, July 31st. • We understand that many of you will want to visit with your camper before or after their show, but please keep in mind, you will be picking them up Saturday morning to go home, and will have lots of time then to visit. • Campers are not allowed to leave camp for dinner or after the performances. Every minute of camp time is precious and we want your child to have all of it they can! The last night of camp is filled with special rituals and traditions that we don’t want your child to miss out on. Featuring: Noah Barkan, Katie Bouffard, Katie Butler, Kelly Conway, Nicholas Ear, Rowen Fisher, Mia Freudenberger, James Gay, Maggie Haran, Charlotte Holder, Dean Jost, Delorian Lewis, Coralie Lyford, Sofie Melledy, Nadav Perlman-Greenberg, Katie Power, Shelby Ritterson, Tori Shears, Ivy S.
We don’t want them to leave, but Saturday is Check-Out Day. Please plan to pick up your camper between 9-11 AM Saturday, August 4th. We will send out an email with lots of additional information next week. Check out our website for nearby accommodations using this link: https://www.appelfarmartscamp.org/camp/visiting-camp-appel-farm/nearby-hotels-appel-farm/. Visiting Day is between 10 AM – 6 PM Saturday, August 4th. We will send out an email with lots of additional information next week. We look forward to seeing you this weekend! Don’t worry if you can’t make it to the Showcases; we will be videotaping all of the performances, and they will be available after camp.